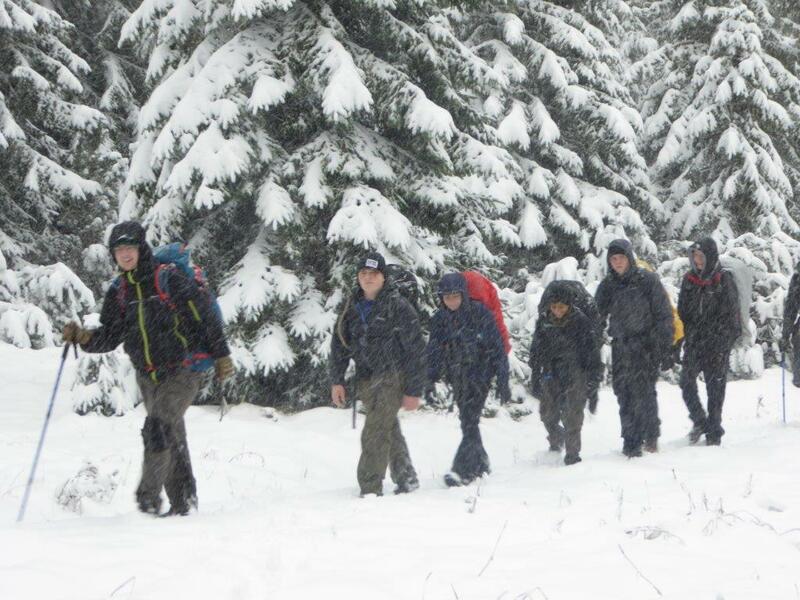 Between 17th and 27th October 2015 a group of Cadets, and Adults from Oldham Hulme Grammar Schools Combined Cadet Force visited the Carpathian Mountains of Slovakia and Poland to complete a 6 day trek through the Slovakian and Polish Tatra Mountains as part of the Gold Duke of Edinburgh’s Award Expedition. Our journey started with a comfortable flight on Lufthansa from Manchester to Krakow followed by a 2 hour bus journey to Zakopane which was to be our base during our stay. After completing the necessary admin and briefings in Zakopane the group made their way by road to the village of Tratanska Kotlina in Slovakia for the start of their adventure. Leaving the village, the group followed the Dolina do Siedmiu Zvodel, crossing many bridges as they gained altitude in the heat of the day before heading along forest tracks with the white limestone cliffs of the Belianske Tatras as a back drop in their quest to reach Chata Plesnivec – our first nights rest. Waking for breakfast at the Chata Plesnivec we had been transported from a warm pleasant mountain scene full of sunshine and stunning views to a winter wonderland due to the very early arrival of the winter snows. It was the earliest snow fall for over 12 years, and we were unlucky (or lucky depending on your point of view) for this to coincide with the start of our second day in the mountains. 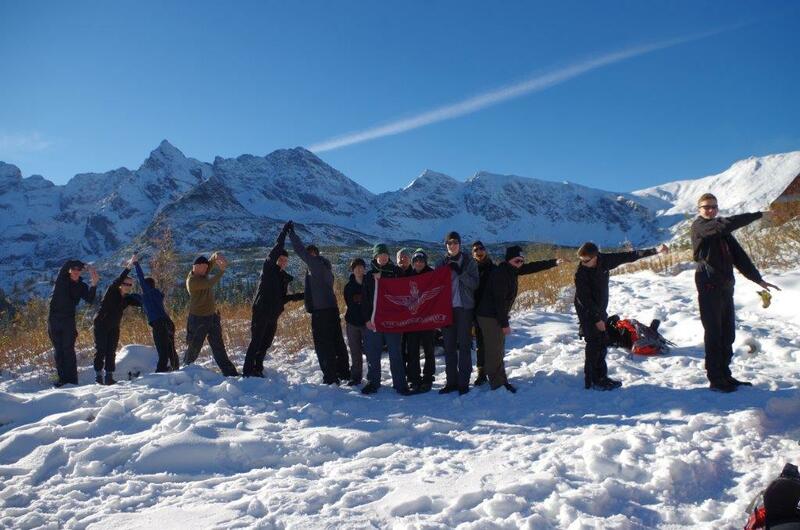 However, the ever present snow presented the group with no major difficulties as we kept our plans under constant review, changing them as necessary to ensure the safety of the group in the continuously changing weather conditions. From the Chata Plesnivec our trek would take us thru Slovakia’s White Tatra for a further 3 days continually gaining altitude, as we passed through the Refuges of Zeleno Pleso, Chata Zamkovskeho, and Popradskom Plese, via the Lakes – Pleso Staw, Skalnata Chata, Slaski Dom, and crossing the Rakuski Pass at 2030m, and the Ostrava Pass at 1978m. Reaching the Popradskom Plese the views were disappointing and, as the snow continued to fall, we settled in for the night and discussed our options for the border crossing in the morning with our local guides and members of the local mountain rescue. After a good night’s sleep we visited the ‘Symbolic Cemetery’ for victims of mountaineering accidents in the High Tatras or tragic circumstance in the greater ranges. The visit had added interest for the group due to the fact that our local Guide’s partner had been tragically killed on Nanga Parbat in 2012. After paying our respects, we set off towards the Morskie Oko hut on the Polish side of the mountains and our climb to the summit of Mount Rysy. Climbing steadily the weather worsened and as we reached an altitude of 2200m the temperature dropped suddenly and it started snowing heavily again. It was therefore time for another change, so we made our way to lower ground with our descent becoming more treacherous as we made our way off the mountain to the warmth of the Morskie Oko hut, which is one of the oldest huts in the High Tatras. The following day we set off towards the 90 year old Morainic Hut nestling on a plateau set amongst fir and pine trees in the forest, picking our way down a steep snow covered track towards our night’s refuge. Suitably rested, we set off on the final leg of our journey out of the mountains and forests along old tracks towards Zakopane. Our journey through the Slovakian and Polish High Tatras was both exciting and challenging covering over 97km and 4950m of ascent. The whole group were amazed at what they had achieved – and rightly so. 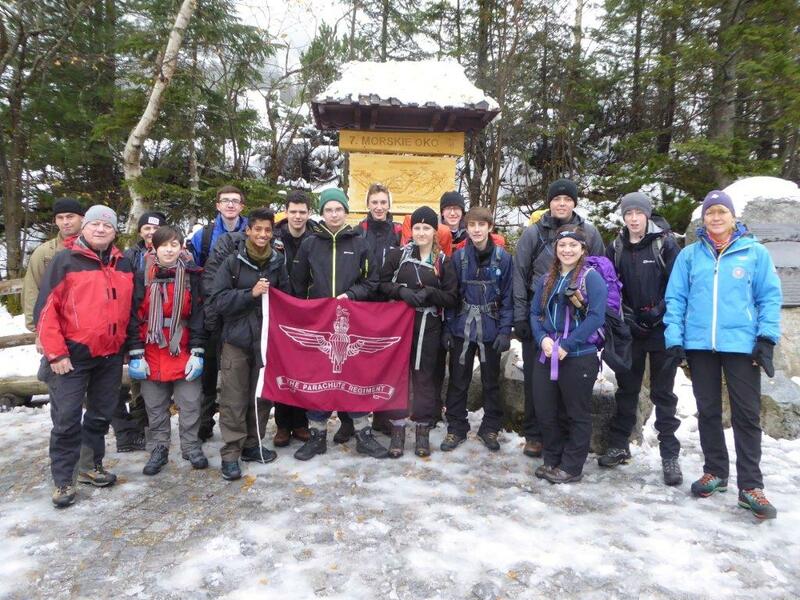 It was an achievement to be proud of, and one which had tested and challenged the cadets in a harsh environment. In Zakopane, the group explored a local Polish market and restaurant complete with Polish musicians. Leaving Zakopane, visits were arranged to Auschwitz, and Auschwitz Birkenau. At Oswiecim (Auschwitz) our guide painted a harrowing tale of the horror of what life had been like for detainees during this time which had a profound effect on most of our group, especially after seeing the archive film footage and walking through the death camps visiting the various blocks that housed the detainees. In Krakow, the group visited to the Schindler Factory Museum and explored the many sights of Krakow old town during a city tour. Group at the Morskie Oko. 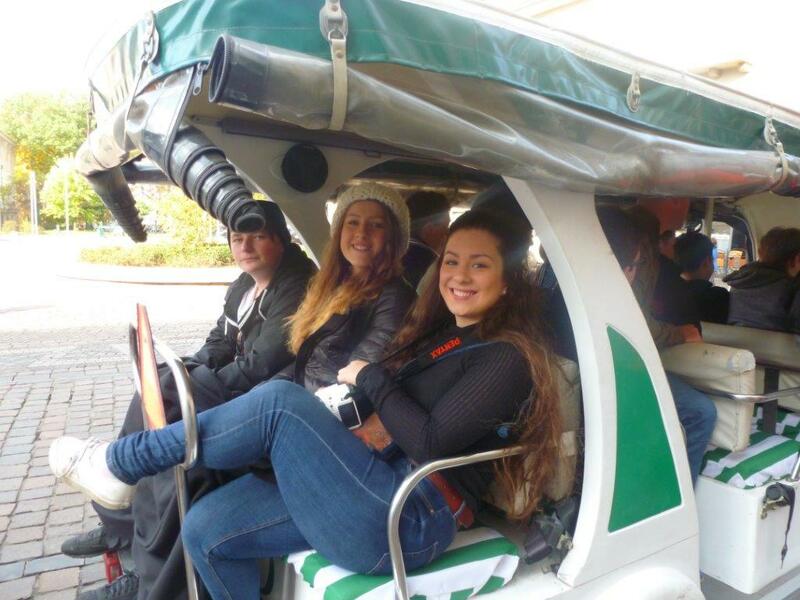 Jack, Lara and Jess hitching a ride. 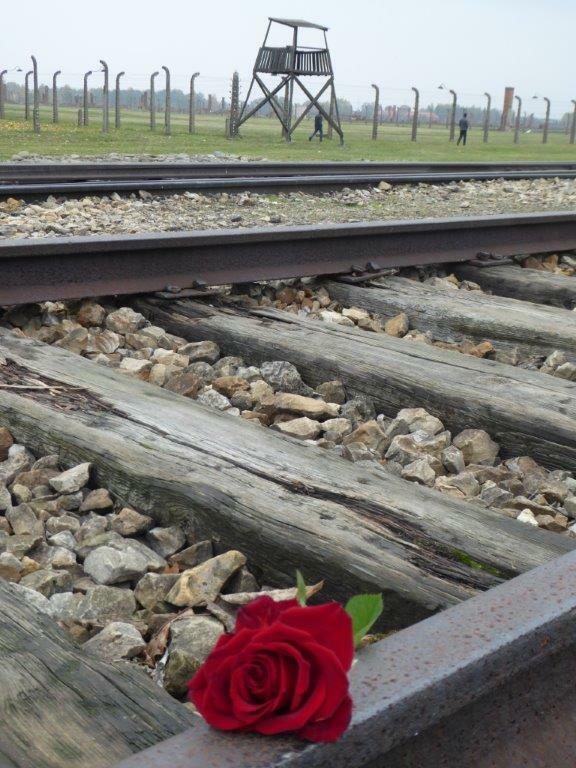 Past and present – Birkenau. Where has the sun gone? !